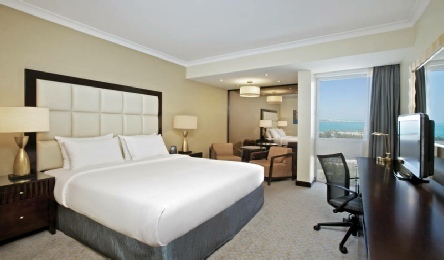 Set in the heart of the city and just a short distance from Abu Dhabi’s most popular attractions, the Hilton Abu Dhabi is a great centrally located beachfront hotel with plenty of facilities. 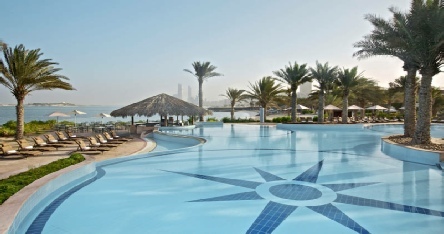 2019 package holidays to the Hilton Abu Dhabi Prices are per person based on two sharing. Prices include flights, transfers and accommodation, and are subject to availability. 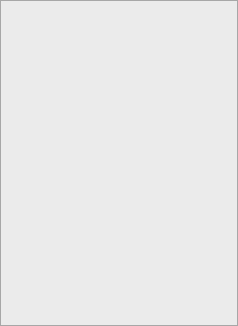 Flights from Heathrow - other departures also available, call for details. Holiday Ref T0617W. From the stylish Gardenview Rooms to the peaceful Seaview Rooms, enjoy glittering vistas of the Arabian Gulf, or opt for an Executive Floor Room with additional access to the Executive Club which offers free Wi-Fi, breakfast and a selection of refreshments throughout the day. By day, be pampered in the Hiltonia health club and spa, before heading to the exclusive Beach Club, located via a pedestrian tunnel on the hotel’s 350 metre-long private beach. Enjoy a light refreshment in the beachside restaurant, before trying your hand at an array of watersports which include jetskiing, sailing and fishing. By night, dine in a variety of the hotel’s world-class restaurants serving a range of cuisines which include Japanese, Lebanese and Italian fare. For a spot of entertainment with your meal, why not head to the popular Jazz Club.